N64 Yoshi's Story (USA) in 10:39.67 by bobmario511. Yoshi's Story (1997), a loose follow-up to Yoshi's Island, tracks the adventures of the Yoshi clan as they attempt to reclaim the Super Happy Tree after it is stolen by Baby Bowser. This apparently involves eating copious amounts of fruit in an effort to find happiness for themselves. 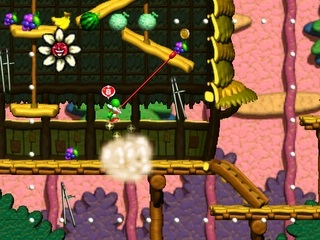 Here, the Yoshis stuff their faces so quickly that one wonders if this is an adventure or an all-you-can-eat banquet. This is an improvement of 20.53 seconds over the previous movie by Comicalflop thanks to several small improvements.